If you missed last week’s outstanding Alumni Career Panel or just want to hear more from English and Creative Writing alumni, you’re in luck! 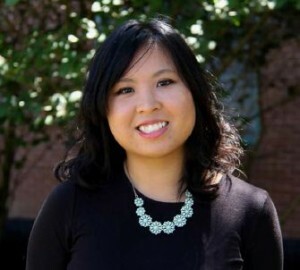 As the first in a series of career profiles featuring recent English and CW alumni, Eli Chen (Creative Writing, 2011) talked with us about her work as a science reporter for NPR member station WDDE. Our graduate assistant, Valerie O’Brien, chatted with Eli last week about her work as a reporter and her experiences as a UIUC undergrad. VO: What did you major in at U of I, and what year did you graduate? Eli: ‪I double majored in Creative Writing and Earth Systems, Environment and Society. I was initially supposed to graduate in 2012, but ended up being 2011. Saving on one year helped with having enough to attend graduate school the following year. VO: ‪What graduate degree did you pursue? Eli: ‪I got an MA in journalism at the City University of New York’s Graduate School of Journalism, class of 2012. 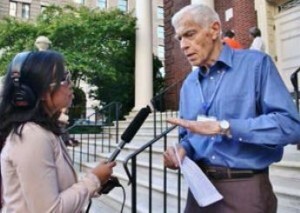 I concentrated in science journalism, with a special focus on radio. VO: ‪And what do you do now? Eli: ‪Right now, I’m the science reporter at Delaware Public Media/WDDE, the NPR member station that covers the state of Delaware. I’m also a producer for a project called iSeeChange, that crowdsources environmental observations from the public and turns those sightings of environmental change into stories. That project can be found at http://iseechange.org. VO: How long have you worked for WDDE and iSeeChange? Eli: ‪Today is actually the one year anniversary of my employment at WDDE. And we launched iSeeChange in April. Eli: ‪Thanks, it’s been a fun year. VO: ‪Can you tell me a little more about some of the iSeeChange observations the public has shared for and the stories you’ve developed from them? Eli: ‪Yeah, so we’ve produced like five stories at this point. The first one we did was actually an observation based in Cape Cod. I was the nearest partner, geographically. ‪And basically the beaches, especially at the town of Sandwich, are eroding at a rapid rate. The government has attempted to nourish the beaches only to have their work completely undone by coastal storms. A radio producer located there basically posed this question, “Will more coastal storms cause us to lose our beaches faster?” What iSeeChange does is we pose the public’s questions to a scientist, basically to start a dialogue about the changes people see in their own backyard. The changing environment is a difficult topic to communicate, especially on a personal level. That was a big reason I chose the majors that I did when I was at U of I, and though I didn’t really foresee participating in this exact project, it makes perfect sense that this was where I was headed. milar to what you’re doing now? What first got you interested in science journalism? Eli: ‪When I was in high school, I had no interest in science, actually. But somewhere along the way I got my hands on a couple books written by Michael Pollan. ‪So I started with an interest in the environment. I was a pretty angsty suburban teenager and for some reason Pollan’s books really spoke to me, especially the Eater’s Manifesto. I guess his writing exposed some of the difficult truths behind the things we eat every day and I really wanted to be able to do that. I would say though that my internships during graduate school were what made me the science generalist I am now. VO: Where did you intern? Eli: First at The New York Times ‘ science desk, updating their Scientist At Work blog and editing their weekly podcast. And right after that at Science Friday, when it was still being distributed by NPR. I learned a lot from working with their producers and for Ira Flatow about what it takes to be a good science journalist. And it allowed me to be exposed to a number of topics, like space and medicine that I didn’t know anything about. VO: Do you find yourself drawing on skills from your undergrad Creative Writing experience as well as from your grad school internships? Eli: ‪It’s been a while since I’ve sat in a workshop. But I think the most important thing I got out of the major was just having a means to hone my craft. When I started as a freshman, for example, I tended to be really verbose with my writing. I also had a hard time putting concrete details in stories that I wrote for fiction classes, as ridiculous as that sounds. And I think I was very self-centered when it came to the characters I wrote about, and by the time I graduated I wanted to gain the ability to write about different people and experiences, so that’s why I pursued journalism. VO: Finally, could you share one piece of advice you’d offer to current UIUC Creative Writing undergrads? Eli: ‪Based on my experience, I’d say to keep your minds open to opportunities. Which I’m sure sounds very bland and general, but I chose the path I did because I was seeing a movement happen with science journalism. Especially with podcasts like Radiolab and so many other emerging platforms that are looking at new ways to tell science stories, I saw something that looked really exciting and challenging, something that would put my writing skills to good use. For examples of Eli’s work, check out some of her recent stories at delawarepublic.org/post/iseechange-why-are-more-sharks-being-caught-delaware-coast and delawarepublic.org/post/enlighten-me-ud-study-mice-mating-songs. We love hearing from our alumni! Are you a UIUC English or Creative Writing graduate? Would you like to tell us about your career? Contact Valerie O’Brien at vobrien2@illinois.edu. This entry was posted in alumni, career, plan, writing by KW. Bookmark the permalink.